Ohio Safety is governed by the Ohio Occupational Safety and Health Administration (OOSHA) administers and enforces workplace safety and health regulations at private facilities in Ohio. 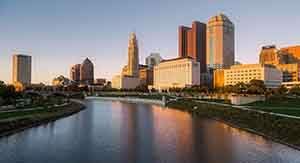 Ohio’s Bureau of Worker’s Compensation (BWC) regulates public sector employers and provides compliance assistance and training services to such employers under the state’s Public Employment Risk Reduction Program (PERRP). Ohio does not have a registered state plan with OSHA. Employers in the state operate under the federal guidelines established under the OSH Act of 1970. The Act’s General Duty Clause mandates that all companies provide a safe environment for their workers. Ohio Safety programs follow the essential guidelines of OSHA with regard to employee training. For example, the Ohio OSHA Safety Training curriculum for Construction workers is modeled after OSHA’s Outreach Training Program. That program is composed of two levels of essential safety training. The first level corresponds to non-supervisory, line workers and is available through the OSHA 10 Hour Construction Training Course. It covers an overview of OSHA’s tenets for safety practice and risk management. The second level attends the supervisory aspects of risk management. This is covered in the OSHA 30 Hour Construction Training Course. Both courses are comprehensive and OSHA-Accepted in all 50 states. These courses have complementary equivalents for non-construction industries in the OSHA 10 Hour General Industry Training Course and the OSHA 30 Hour General Industry Training Course. Both of which are sufficient to provide general Ohio Safety compliance. In Ohio employers participate in OSHA’s Safety and Health Achievement Recognition Program (SHARP). Ohio Bureau of Workers’ Compensation is a site loaded with useful information. See specific informational pages also for Toledo, Oh.